8 March 2017 – An Unesco-Kabul delegation, composed by arch Maria Rita Acetoso and arch. 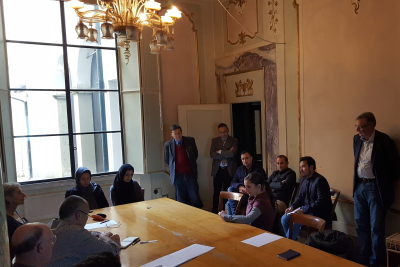 Fabrice van Teslaar, and LaGeS working group led by prof. Mirella Loda, currently engaged in drafting a strategic masterplan for the city of Bamiyan (Afghanistan), met at the Department SAGAS of the University of Florence. The meeting, which was also attended by the students enrolled in the current edition of the Master in Urban Analysis and Management organized by the University of Florence, all of them coming from different Afghan public institutions, offered to the participants the opportunity to share important information concerning current development and safeguarding projects at Bamiyan World Heritage site, Afghanistan. The meeting also served as a platform for preliminary discussions aimed at coordinating the activities carried out in Bamiyan under the various Unesco projects with the realization of the Bamiyan Strategic Masterplan by Lages working group. The meeting was realized under the auspices of the Italian Agency for Development Cooperation.